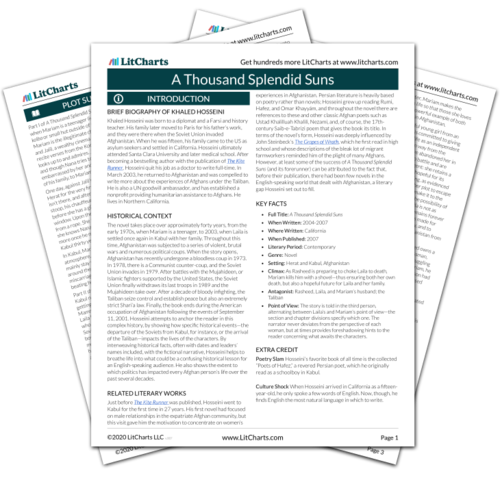 Instant downloads of all 942 LitChart PDFs (including A Thousand Splendid Suns). 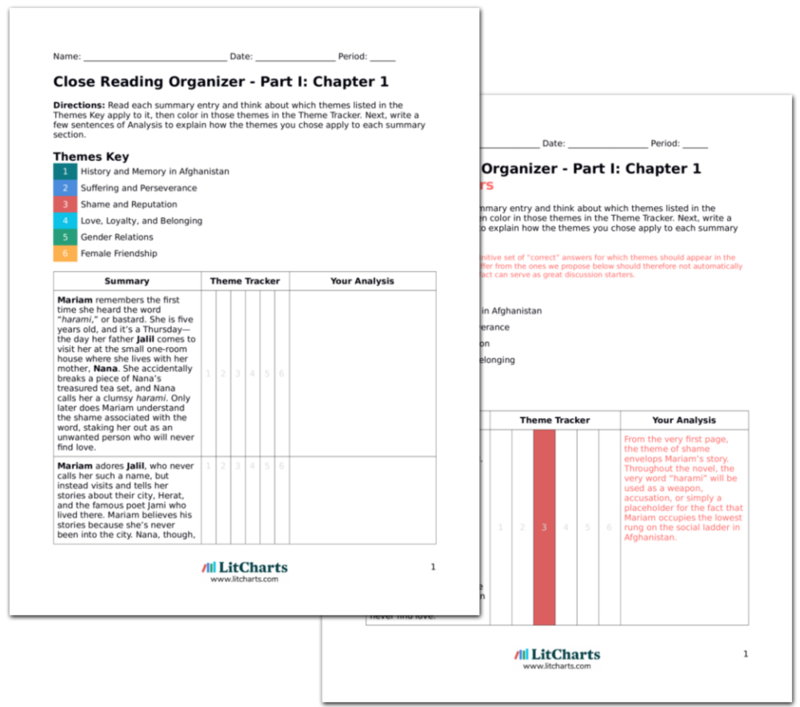 LitCharts assigns a color and icon to each theme in A Thousand Splendid Suns, which you can use to track the themes throughout the work. Mariam’s grief seems to wash over her at unexpected times, in overwhelming ways, though other days resuming normal life seems more manageable. Still, Mariam doesn’t like to go outside, and is jealous of the neighborhood women who have many children, such that they even complain about them. Once again, Mariam must endure another period of grief for a life lost. Being surrounded by so many women with children only deepens her sadness and suffering. Sometimes, Mariam thinks that she is being punished for abandoning Nana. Other days, she is angry at Rasheed for celebrating prematurely, or at herself for eating the wrong things or sleeping in the wrong position, or at God for taunting her with happiness. Then she grows guilty for her blasphemous thoughts and prays for forgiveness. Mariam cannot seem to grapple with her miscarriage without finding something or someone who is guilty, even if that someone is herself. She even wrestles with her relationship with God, though her guilt at blasphemous thoughts shows that she is far from renouncing religion. Rasheed, meanwhile, has grown moody and silent, complaining about Mariam’s cooking or cleaning. He no longer buys her gifts or shows her around Kabul. One night she asks if he’s angry with her, but Rasheed is initially silent and then tells her to stop pestering him. Mariam, wanting a proper burial, digs a hole in the backyard, placing the winter coat inside and praying. The miscarriage that has so devastated Mariam seems to have done the same to Rasheed, though instead of suffering alone he takes it out on his wife. Mariam’s process of grieving is more introspective and reveals a more profound struggle with God and fate. Baena, Victoria. "A Thousand Splendid Suns Part I: Chapter 14." LitCharts. LitCharts LLC, 28 Jul 2015. Web. 20 Apr 2019. Baena, Victoria. "A Thousand Splendid Suns Part I: Chapter 14." LitCharts LLC, July 28, 2015. Retrieved April 20, 2019. https://www.litcharts.com/lit/a-thousand-splendid-suns/part-i-chapter-14.